Though our Cyberpunk Revisited series is largely finished, this new release necessitated its revival. After all, it's a: (1) cyberpunk-themed; (2) point-and-click adventure game; that is (3) published by Mi-Clos Studios, who gave us the exquisite space survival game Out There. In some ways, I guess you could say I've been waiting my whole life for this game--or, at least, the thirty-odd years since I first played Manhunter: New York. Could this title possibly live up to my expectations? The answer, as far as Episode One is concerned, is "yes and no." In Void & Meddler, you star as Fyn--a hardboiled DJ who has lost her memory of the past two years and wants it back. So you search for clues across a city that feels a lot like what New Yorkers might have imagined the future to look like in 1980. In other words, gritty, grimy and bathed in neon rain. The art design draws inspiration from both the warm, cartoon-like style of Broken Sword and pixelated Sierra and LucasArts classics. 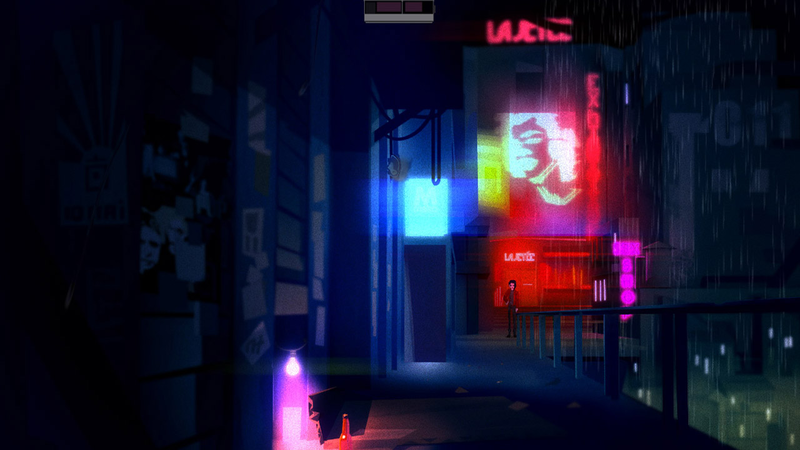 But Void & Meddler also features some of the best use of color I've ever seen in a video game--buildings are bathed in the proverbial neon rain, while raindrops pitter and patter on a virtualized camera lens. It is absolutely stunning, and manages to feel nostalgic and progressive at the same time. Unfortunately, the puzzle design doesn't evoke the same feelings. In the classic point-and-click mold, you basically move Fyn from place to place, picking up and interacting with objects for use in one of the game's many puzzles. 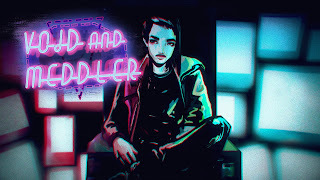 Void & Meddler gets extra credit for creating multiple solutions to its puzzles, which means you don't have to spend hours just trying to find that one thing, without which you can't proceed. On the other hand, there's no narrative momentum--something games like Gemeni Rue, Lost Echo or Stasis all use to great effect. Instead, you just click on anything--in the hopes that you might be able to accomplish something that is, at best, vaguely defined. Simply put, it's never really established why we should care about Fyn getting her memories back, and never all that clear how the things we do in the game relate to that endgoal. That formula might have worked for King's Quest, but it's not 1984 anymore. Still, the game has enough style to keep my interest. I do, however, hope for more dynamic puzzles and a clearer sense of story from Episode 2. Bonuses: +1 the color; +1 in the neon rain. Penalties: -1 for retrograde puzzles; -1 for narrative issues. Our scoring method explained in full.